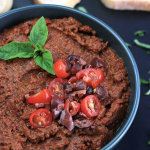 This Sun-Dried Tomato Tapenade is filled with nutrients like potassium, iron, thiamine, riboflavin, niacin and cell protecting oleic acid from the olives. Not only is it healthy, it’s delicious. I am a firm believer that food can aid in the healing of our bodies and I’m living proof of that. Over 5 years ago I became a vegetarian, stopped eating meat and started to exercise more regularly. After several weeks some of the chronic health problems I was experiencing started to get better. After several months I was feeling absolutely fantastic, and using my asthma inhaler less and less. 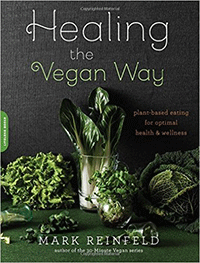 I was given a copy recently of Mark Reinfeld’s Healing the Vegan Way, filled with delicious vegan recipes. 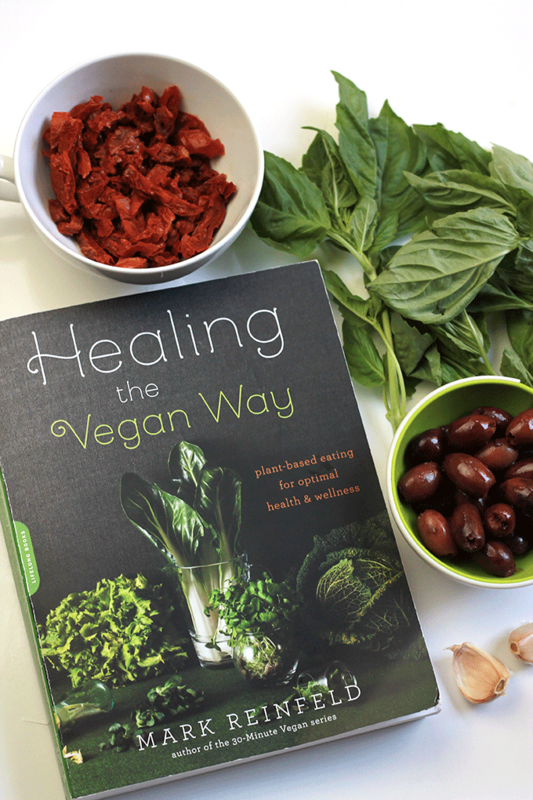 This book is more than just a cookbook, it’s a guide to healing with whole healthy foods. Mark, the winner of Vegan.com’s Recipe of the Year Award, has more than 20 years experience preparing creative vegan and raw food cuisine. He was the executive chef for the North American Vegetarian Society’s 2012 – 2015 Summerfest, one of the largest vegetarian conferences in the world. His first cookbook, Vegan Fusion World Cuisine, coauthored with Bo Rinaldi and featuring a foreword by Dr. Jane Goodall, has won several national awards, including a Gourmand Award for “Best Vegetarian Cookbook in the USA”. Part one of the book is about how plant-based foods can help prevent as well as heal health challenges. There are also stories of healing from diabetes, high cholesterol, and even slowing of cancer cell growth. Basically part one of the book is a resource guide to a healthy plant-based diet. I love that the recipes in the book are simple, uncomplicated and delicious. 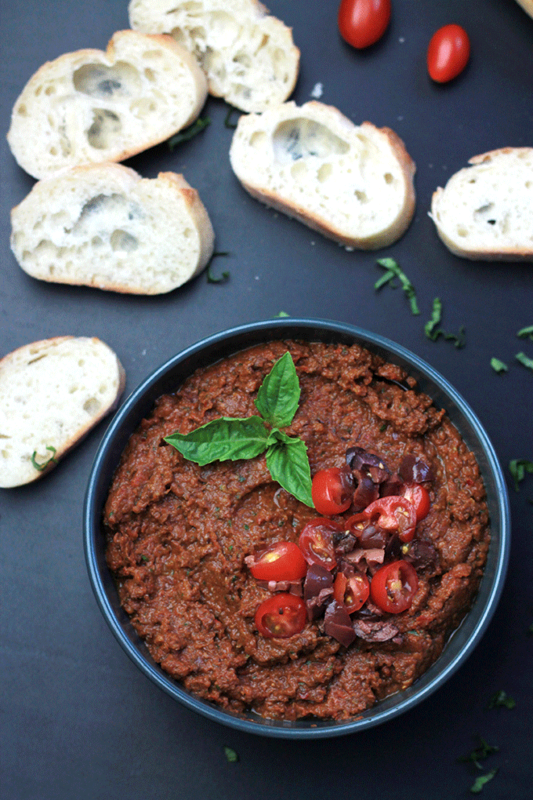 This Sun-Dried Tomato Tapenade is one of my favorites and it takes less than 15 minutes to make. 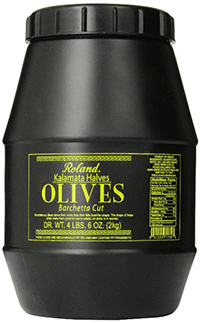 I like to add chopped tomatoes and olives on top for extra flavor and texture. If you make this recipe or a version of it, take a picture and share with me on Instagram, tag it #thewholeserving or leave a comment below. 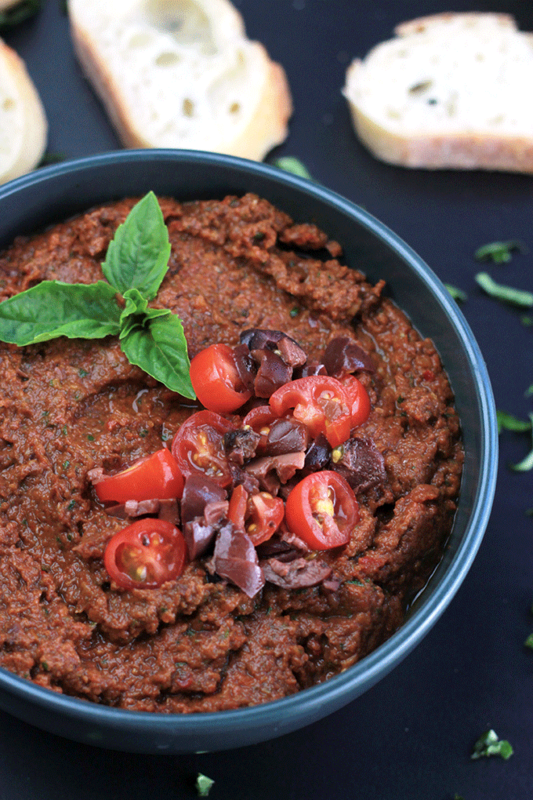 I’d love to see or hear about your version of Mark Reinfeld’s Sun-Dried Tomato Tapenade. 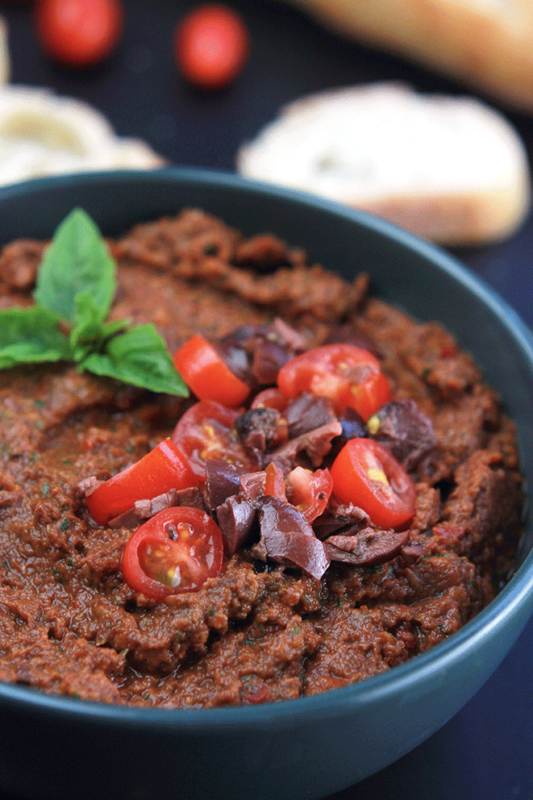 Shop items used to make this recipe. 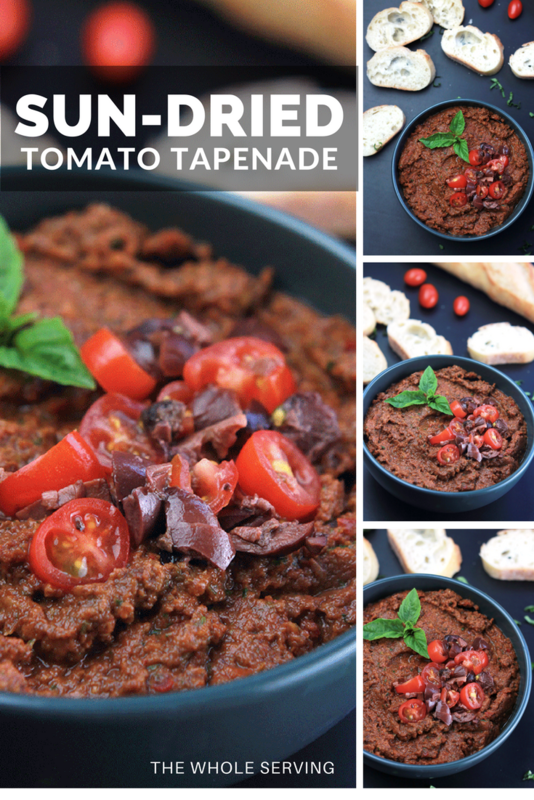 This tapenade looks beautiful Celeste – really yummy! Thanks Sarah, It’s goes well with salads, sandwiches and chips. Celeste this looks so healthy. I really need to do something about my weight gain. If you think that cutting out the meat will help me to lose weight then I’m all for it. 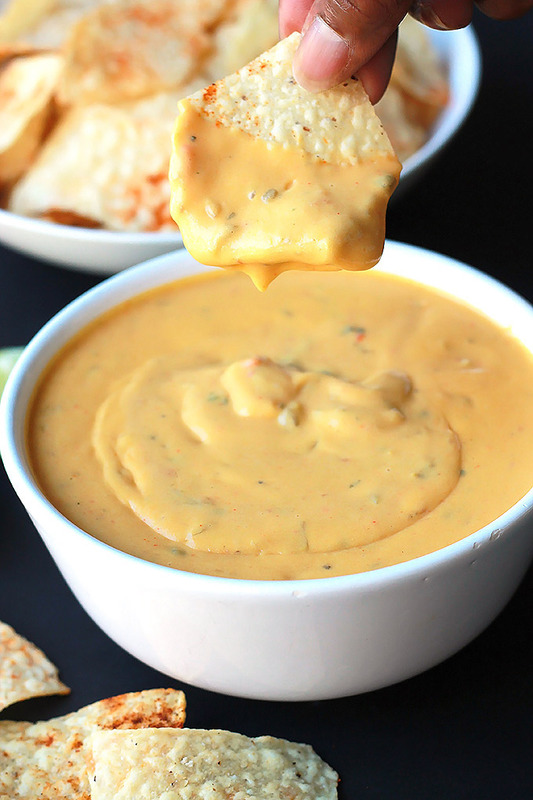 All of your recipes are mouthwatering. 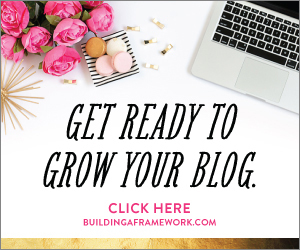 Pinned to make as soon as I get some more tomatoes. Mary several years ago when I stopped eating meat, drinking soda and exercising I noticed not only that I was feeling better but I was losing weight. I also started each day with a green smoothie. I’m with you on that. After my photo shoot I couldn’t stop eating the stuff. Sooooo good! 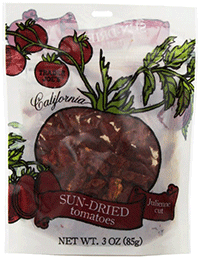 First off, I love sun dried tomatoes and tapenade! This is perfect! Thanks for the recipe. Second, I loved hearing more about you, why you stopped eating meat products and what it’s done for you. Totally cool! 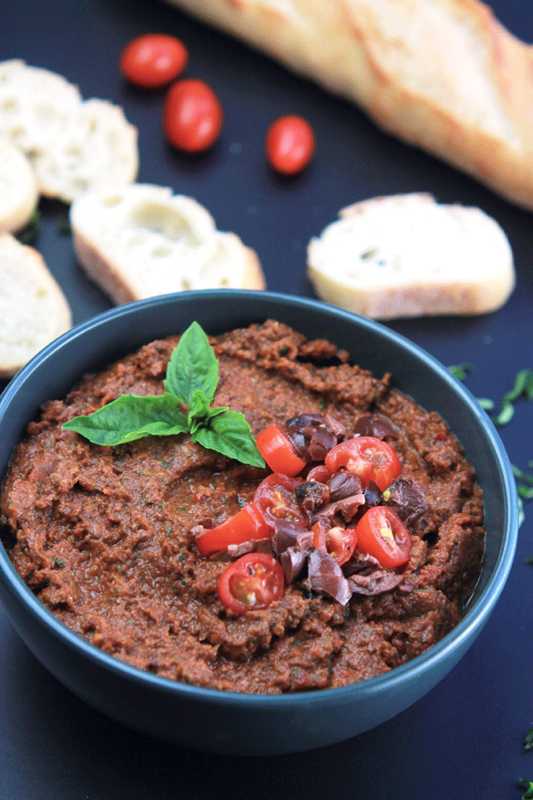 What’s great about it is it can be used as a sandwich spread to add a bit more flavor to a plain sandwich. That is so right Ginger, vegans have to be creative to make meals tasty and satisfying. Oh gosh. This looks so beautiful, I love the deep red color! Also love the flavor combinations with the big, bold flavors together! Thank you Petra, these are certainly some bold flavors and it is so delicious.